Herman Miller Chairs are currently one of the most expensive ergonomic chairs on the market. What distinguishes these chairs is a modern, sleek look and innovative design. These chairs are very pricey, that’s why people often ask which Herman Miller should I buy and which is the best. They want to buy proper model that suits them best and don’t waste their money – and it’s absolutely right move. 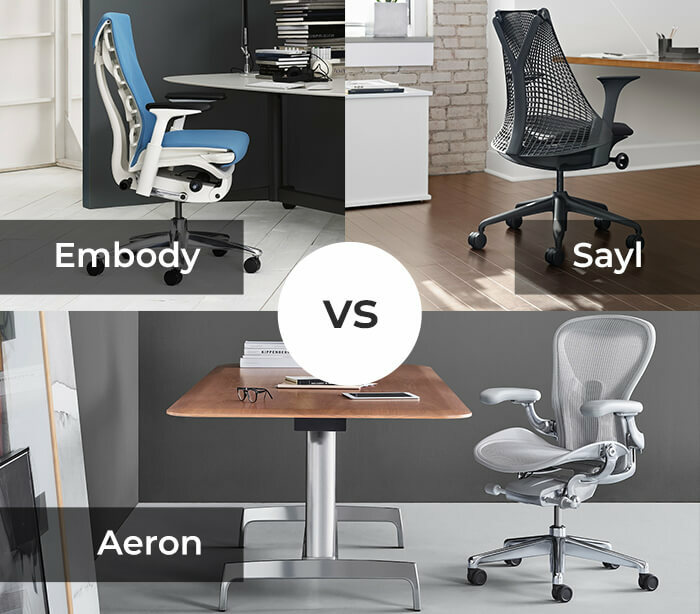 Currently Herman Miller offers over 15 different models of desk chairs, but here we will focus on TOP 3 Herman Miller chairs, which are the most popular and in my opinion the best ergonomic chairs from this brand: Herman Miller Embody, Herman Miller Aeron and Herman Miller Sayl. My reviews and comparison will help you to answer the question: Which Herman Miller Chair should I buy? Who Should Buy Herman Miller Embody? People with hip pain, lower back pain, shoulder blade pain and/or bad posture or people who work in seated position for over 4 hours a day and want to avoid these issues. Herman Miller Embody Chair was designed with the participation of over 20 physicians and PhDs specialized in the field of physical therapy, vision, biomechanics and ergonomics. The backrest and the seat are constructed with dynamic matrix of pixels so they automatically adjusts to user’s movements. Thank to this feature, Embody Chair by Herman Miller supports user in every position, distributes his weight properly without pressure on the spine and prevents heat buildup. The backrest design is very similar to human body: it has a central spine and flexible ribs. There is a Backfit adjustment that allows user to find the most comfy and supportive position, adjusted to his spine natural curves. You can adjust the backrest to be more curved or flat so it could align with your back. When you change the position the backrest “follows” your moves and supports you, no matter if you recline or lean forward. Embody backrest support the spine from the sacral area, through the lumbar spine, up to the shoulder blades. Is Herman Miller Embody worth buying? And most important who should buy it? Apart from the Backfit adjustments, Embody Chair by Herman Miller has few other features that you can adjust to find your comfort zone and maintain good posture when you spend long hours in front of the computer. You can lower or raise the chair and change the seat depth to adjust it to your height and legs length. These features allow you to find proper position for your feet (you should be able to put them flat on the floor) and keep your knees at a 90 degree angle. Moreover, you can slide the armrest up and down and left to right to find supportive position for your forearms and avoid wrist fatigue and shoulder pain. User can also adjust the angle of the tilt and change the tilt tension. Thanks to that your back will be always supported – when you sit upright, lean forward during work or tilt back and relax. There is no lock for reclining position, but you can choose how far the backrest tilts. The seat has 4 different support layers which not only provide comfortable position for your hips, pelvis and thighs, but also allow for nice air-flow so you could always stay cool as you sit. This ergonomic office chair by Herman Miller has truly modern and innovative design. Embody looks really cool and stylish. There are over dozen different color versions to choose, but keep in mind that price can vary even up to $200! Make sure to check the availability and compare all price before you purchase Embody Chair by Herman Miller. What Customers Think About This Chair? People like the back support adjustment which allows to find the proper curve that would fit the spine natural curves without causing painful pressure. Customers say the proper backrest adjustment is very important as the chair may seem uncomfortable if you don’t do it. They also recommend to five it few days as the body needs to adjust to it as well. Moreover Embody Chair by Herman Miller is very comfy for people who like to sit more upright and it gives nice back support for those who spend long hours at the desk. Even people with chronic back pain have been using this chair and it has help them a lot. Users praise it also for helping with blood circulation in legs. Another advantage is the high quality fabric on the seat and back. It breathes and prevents users from sweating and it’s supportive and a bit cushy at the same time. Seat depth adjustment is one more asset of Embody Chair. As drawbacks people mention: lack of headrest (you can’t even buy it separately), the armrest have only two adjustments, they don’t move back and forth. Some customers say the seat fabric is too firm and stiff for them. Classic Aeron Chair with lumbar support is designed for people with lower back pain. Aeron PostureFit is great for lumbar pain and posture. People with shoulder and neck pain should add the headrest. Herman Miller offers wide range of different versions of Aeron Chair. There are three different sizes because we all differ in height, weight and body type. 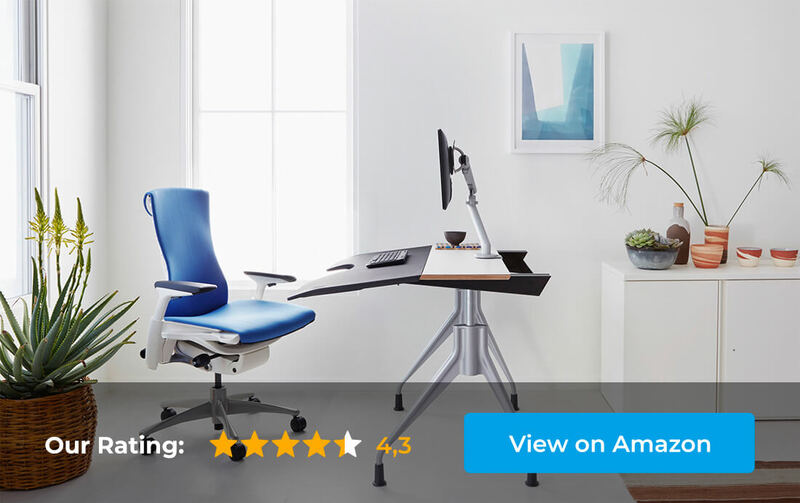 There are also two versions for different back problems and pains: classic Aeron with lumbar support and Aeron PostureFit that helps with posture. There is also option of adding a headrest if you struggle with neck pain. The backrest and the seat are covered with woven suspension textile which is not only elastic and flexible, but also provides proper back support and allows for the air circulation. It’s a useful feature for those who have the tendency to sweat or those who live in hot climate, but it may be too airy and cold in winter. The chair features Kinemat tilt mechanism which means it follows the moves of your body and allow you to find the most comfy and supportive position for your spine, pelvis, hips, knees and feet. 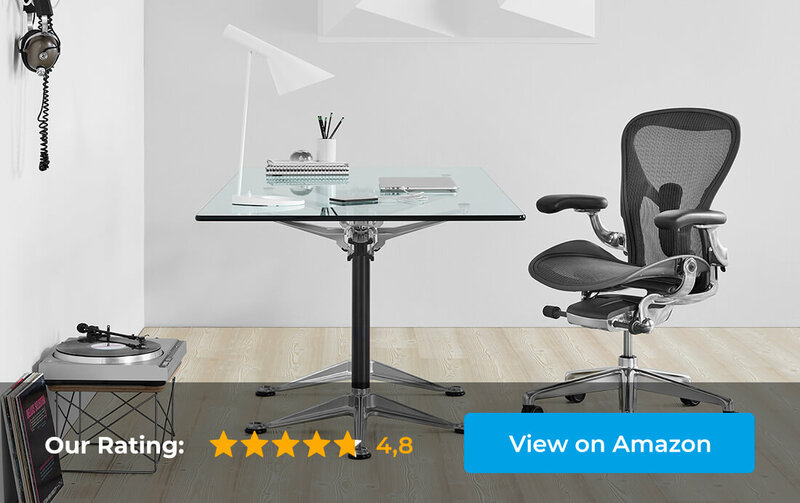 Aeron Chair by Herman Miller is very adjustable, which is not a surprise at this price point. The chair slides up and down to adjust to user height. You can also adjust the tilt angle (how far you want the backrest to recline) and tilt tension (how difficult it is to recline). The armrests go up and down, forward and backward and pivot from left to right. You can move the lumbar support lower or higher so it could fit your natural spine curve comfortably. In the PostureFit version you can also adjust the shape of the backrest and make it more curved or flat by moving the lumbar support closer of further to your back. Keep in mind that this new version of Herman Miller Aeron is more pricey (even up to $300!). To see current (and probably the best) price visit Amazon here. The seat depth is not adjustable, however Aeron comes in three sizes so if you choose it properly, the seat will accommodate your thighs very well. 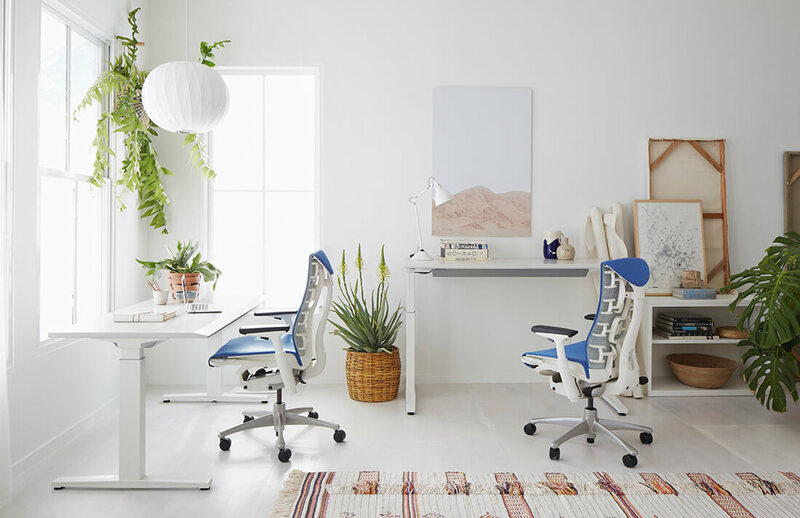 The highest rated Herman Miller chair among these three models. The chair is pricey and the headrest is additional cost; without the headrest there is no neck support. What Amazon Customers Think About This Chair? According to most of the customers this ergonomic office chair is a great investment, especially for people who work at the desk for long hours a day. Some people say it has helped them with back and hip pain. Most of the users agree this chair is very comfortable and the huge amount of adjustments is a big advantage. However, some users mention that these adjustments may be hard to figure out at the beginning. Another drawback is the high price, but a lot of customers say it is worth the money. You can find more information about the Herman Miller Aeron Chair in my ranking of the best ergonomic office chairs for 2018. 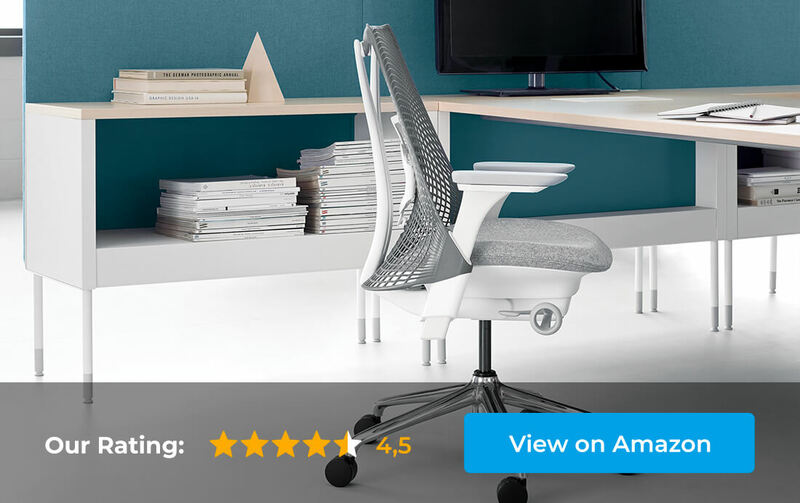 There is also one more chair from Herman Miller that looks similar to Aeron – Mirra 2. Its backrest looks a bit like the Aeron backrest and it offers support for lower back and helps with the proper posture as well. The price is also similar. I’ve read many customer reviews on Amazon and brand official website and some people say it’s very comfy and helpful for back problems, however I found out that even short people say this chair has too short backrest (while they can’t put their feet on the ground) and tall people say it’s too small for them. So if you’re hesitating between Aeron and Mirra 2 I would rather recommend you the former one. Short people (under 5’10”) who experience pain in coccyx, sacral area, lumbar spine and/or wrists. It’s a great office chair for posture and a perfect choice for people who would like to have in their office a chair with ultramodern and fancy design. 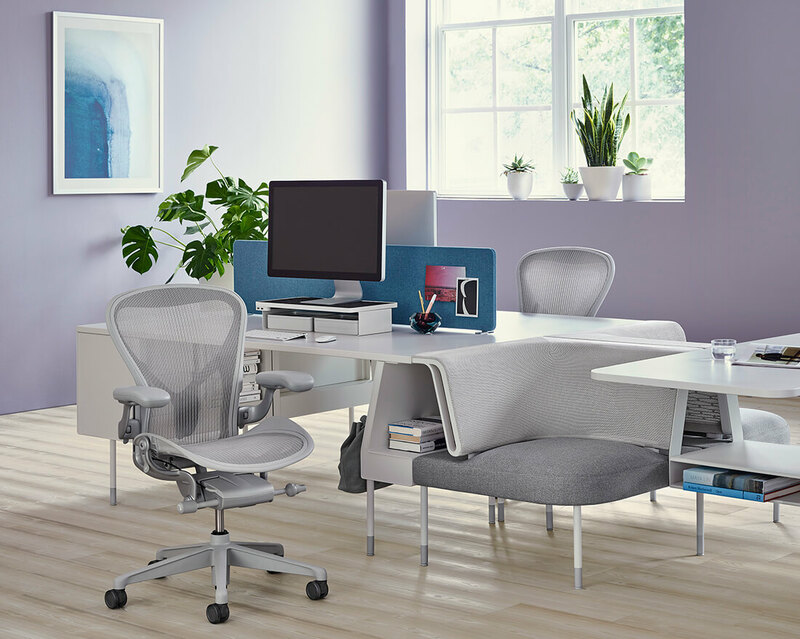 Herman Miller Sayl Chair has very unique design and it’s available in multiple colors so it could match any workspace. It will also look great as a home computer chair. Sayl Chair by Herman Miller doesn’t have standard frame or hard edges. The suspension backrest is flexible and adapts to user’s shape to provide comfort and support for people with different body types. Basic version of Sayl Chair has 3 reclining positions, non-adjustable seat depth (16″) and non-adjustable arms (9.4″ above the seat). The backrest supports the base of the spine, keeps the pelvis in natural and health position and helps user to practice proper posture. Another (and more expensive) version of Sayl has many adjustments. You can recline the backrest in 3 positions, adjust the seat angle and seat depth so your knees could always stay in proper position (at 90 degree angle). There is also forward tilt so the chair follows you as you lean forward during working. The lumbar support can be set higher or lower to fit the natural spine curves. You can also adjust the armrest in 4 different ways: up and down, inwards and outwards, forward and backward and pivot them left to right. Thanks to this huge adjustability each user will be able to find the most comfortable position for his forearms which will reduce the pressure on shoulders and wrist pain. 4D armrests are very useful for people who spend at the desk many hours a day on typing or writing. Sayl has awesome modern appearance and offers over 20 color versions to choose! It’s the cheapest Herman Miller chair among these three models. Versions with multiple adjustments is much more expensive than the basic one. Customers like the backrest for its unique shape, breathability and providing good amount of support, especially for lower back. According to many users it is a great ergonomic chair for long hours as it helps to keep the healthy posture and doesn’t cause back pain. It also helps to relieve the pressure from back and improve blood circulation. Most of the short and average people agree it’s comfortable, however taller users (above 5’10”) complain that the backrest is too short and hurts their shoulder blades. Some customers also recommend getting a mat or special wheels for hardwood floor, to avoid scratches. Hopefully you already know which Herman Miller chair is the best for you and which one you should buy. This is top-notch ergonomic office chair and I know that price is high. That’s why proper choice is so important. But I really hope that with this guide you will make the right decision!